Safe storage of chemicals on the farm is critical to you, your family, workers, visitors and livestock. Maintaining a proper chemical storage room or building reduces the risk of accidental exposure. Incidents with chemicals can be serious and life threatening, so it is important to review your storage area for possible hazards and correct any issues. Have you taken the proper steps to ensure the safety of your chemical storage area? Are chemicals stored in a room or building which can be secured from children, visitors and livestock? Do chemical containers have the original labels? Are chemicals stored in their original containers and never in food or drink containers? Is smoking prohibited in and around buildings where chemicals are stored and when they are being handled? Is the storage area well ventilated and lighted? Are respirators, rubber gloves, aprons, chemical goggles, coveralls and other chemical protective gear available? 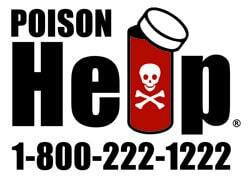 Is the Poison Help Line number (1-800-222-1222) posted in a visible place?